Though a rural town, Natchitoches has proven to be a hub for artistic expression in Louisiana. The unique lifestyle enjoyed by the area's residents has been immortalized in many forms by both local and visiting artists. The area's early architecture is an art form in itself. 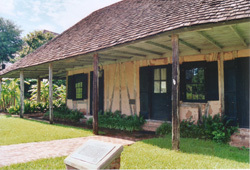 The Cane River region's first settlers built their homes in the French Creole style. Using only the materials around them, they made walls out of cypress timber framing filled with bousillage, a mixture of mud, Spanish moss, and deer hair. This process was broadly known as colombage. The earliest examples of this style were small one-room cottages with their supports dug directly into the ground, a style known as poteau-en-terre. Later, the supports were put upon sills to prevent rotting, a style known as poteau-sur-selle. As time passed, the French Creole style became more refined. In downtown Natchitoches, townhouses with second floor balconies and intricate iron lacework were constructed using the same simple materials. On plantations, settlers adopted a West Indian design for their manors, raising them as much as a full floor on brick piers and accenting them with gallery porches and high pitched roofs. Gradually, different architectural styles were introduced to the region. Today, Natchitoches is home to buildings of such varied styles as Victorian, Federal, Italianate, Queen Anne and Art Deco. The culture of Natchitoches also has been captured in more traditional art forms. Through the late 19th and 20th centuries a string of writers, poets and painters visited and were inspired by this area. The most famous author to live in the Cane River region was early feminist writer, Kate Chopin. The Chopin family had long standing ties with the area. Kate's father-in-law, Jean Baptiste Chopin, was an infamously harsh plantation owner in the Cane River region. Jean Baptiste's cruelty may have been immortalized in the novel Uncle Tom's Cabin. Harriett Beecher Stowe is said to have visited his plantation sometime before she wrote the novel, and some believe she modeled the character Simon Legree after Chopin. Others believe Legree could have been modeled after Robert McAlpin, the previous owner of the estate with whom Chopin is often confused. However, neither story can be confirmed. Kate Chopin married Jean Baptiste's youngest son, Oscar, in 1870. After living in St. Louis and New Orleans, the couple moved to Cloutierville, a small town south of Natchitoches, in 1879. Oscar purchased land and opened a small plantation and a general store, but proved to be a poor businessman and quickly found himself deep in debt. In 1882 Oscar died of complications from malaria, leaving Kate with his debts and six children to raise. Kate decided to take over her husband's business, and she managed to pay her debts within 15 months. For a time it appeared Kate could become quite successful in Cloutierville. However, the women of the village were scandalized by Kate's metropolitan habits, such as smoking and long solitary walks, and they never fully welcomed her presence. In 1884 this tension came to a head when rumors spread that Kate was having an affair with a married planter named Albert Sampite. Kate decided it was time to leave and returned to St. Louis. After moving away, Kate began her writing career. Her time in Louisiana supplied her with material for both of her novels, At Fault and The Awakening. Bayou Folk, a collection of her short stories, features characters based on her neighbors in Cloutierville, and most of the stories take place in the Cane River region. Not long after Kate Chopin left Cane River, Cammie Garrett Henry and her husband moved to Melrose Plantation. Cammie was a college-educated woman who was bored with the lack of intellectual stimulation life on a rural pecan plantation offered. Resolving to bring culture to her doorstep, Cammie opened Melrose to artists, poets and painters from all across the nation. She also supported the Natchitoches Art Colony, which was established by Irma Sompayrac in 1926. It attracted visiting artists and professors who would often split their time between the colony and Melrose. Melrose quickly became one of the most popular artist colonies in the South, attracting such names as William Faulkner, Alberta Kinsey and William Spratling. One of Cammie's most frequent guests was famed Louisiana author Lyle Saxon. 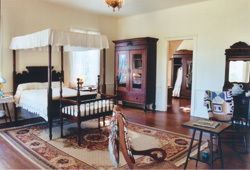 Saxon came to believe that Melrose was the only place he could write fiction, spending months at a time at the plantation throughout his adult life. While at Melrose, he completed his most famous work, Children of Strangers. 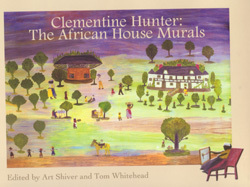 One of the most successful artists to emerge from the Melrose art colony was Clementine Hunter, an African American cook who lived and worked on the plantation. Inspired and encouraged by some of the visiting artists, Clementine began painting simple scenes of plantation life on discarded canvases, window shades and cardboard using left-over paint and donated brushes. Her colorful work captures her memories of the rural south in the first half of the 20th century. Clementine received great fame as a self-taught artist and she became the first African American to have a solo exhibit at the New Orleans Museum of Art. Clementine continued to paint in the area until 1988, when she died at the age of 101. The history and culture of Natchitoches continues to be preserved in art today. Natchitoches has served as the location for three major films: The Horse Soldiers staring John Wayne, Man in the Moon staring Samuel Waterston and debuting Reese Witherspoon, and Steel Magnolias written by Natchitoches resident Robert Harling and starring Julia Roberts, Sally Field, Shirley MacLaine, Daryl Hannah, Olympia Dukakis and Dolly Parton. In recent years two historical fiction novels have been written about the Cane River region. The latest book, Isle of Canes, by Elizabeth Mills, is a dramatization of the life of Creole matriarch Marie Thérèze Coin-Coin. Cane River, by Lalita Tademy, was published in 2001 and has since gained national attention after being recognized by Oprah's Book Club. Local writers, poets, painters, musicians and photographers continue the artistic heritage of the Cane River region. Their work captures the essence of life in this area in a way that can be easily shared with others around the world.